Beneath the great arched roof of York station, one locomotive legend fades into the shadows as another begins to write history on the East Coast Main Line. In the summer of 1962 - its centenary year - the Kings Cross to Edinburgh "Flying Scotsman" express is taken over by the new 3300hp 'Deltics'. Once the world's most powerful single-unit diesel-electrics, these 22 magnificent machines have accelerated the "Flying Scotsman" to its fastest ever timing of 6 hours between the two capitals and soon they will usher in the era of regular 100mph running on the East Coast route. With their rakish good looks and distinctive sound which emanated from an engine originally built for fast naval patrol boats, the Deltics became arguably the most popular diesels ever built. Their final runs on BR in January 1982 after 20 glorious years were greeted by scenes of despair among the railway enthusiast fraternity unrivalled since the end of steam. Six escaped the cutter's torch to reach the haven of preservation including No. 139015 Tulyar, the one shown here, which also holds the unusual honour of being the only BR express locomotive to be put up for auction. It failed to meet the reserve price at Christie's and was later sold privately. Consigned to the sidelines - but not for long - as the new era rumbles by, is steam's fading star: Class A3 4-6-2 No.60103 Flying Scotsman - the locomotive. Possibly the most famous steam engine in the world, history is packed into every inch of her. This is the locomotive which in 1928 helped inaugurate the world's longest regular non-stop run, on the train after which she is named. Six years later Flying Scotsman became the first British locomotive to reach a fully authenticated 100mph. Seen here in her final guise, with German-style smoke deflectors and fitted with a double chimney, Flying Scotsman in the summer of 1962 was unbelievably not scheduled for official preservation. Upon withdrawal in January the following year, however, she was bought privately and since then, with only one hiccup - an ultimately disastrous tour of America which resulted in a change of owner - has continued to steam majestically around the country with all the grace of a true thoroughbred. 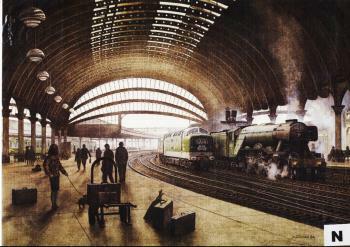 At the time of its building in the 1870s, York was believed to be the largest railway station in the world. Its vast crystal palace roof has survived the ravages of time and the fire-bombs of the Luftwaffe in the Second World War to watch steam give way to diesel. Today it gleams again in newly- restored splendour as it awaits the wires that soon will bring electric trains for the first time.